Ship Your Tedder Equipment With Tractor Transport! Farm Tedder Shipping Services in All 50 States! Tractor Transport has garnered a reputation from our clients as one of the most dependable and versatile hauling services around. Talk to Tractor Transport to ship your farm tedder anywhere in the US, Canada or Mexico. Depend upon us to ship your farm tedders where you want it, when you want it. Talk with one of the experienced logistics professionals at Tractor Transport today, (877) 373-0109. Trust Tractor Transport To Ship Your Farm Tedder Implements! Tedders are used to turn over hay to help speed the drying process. Once hay has dried sufficiently, it can be gathered into windrows for collection or baling. Quicker the hay dries, the faster it can be collected or baled. Tedders attachments are dragged behind tractors. They range from around six-feet wide to nearly 36-feet wide. Some hay rakes have tedders built into them. We Haul all Size Farm Tedders - Big or Small! Pick Tractor Transport to ship your farm tedder. Tedders can be difficult to transport. Most tedders fold together, toward the hitch, at the wheels. Larger tedders travel upright on the trailers and often exceeding height limits. 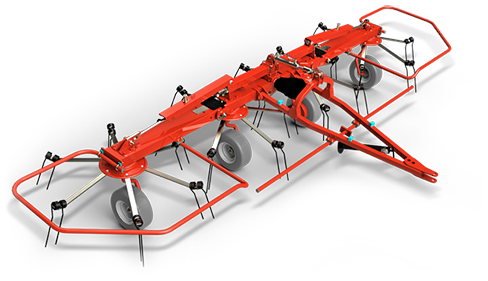 Whether your tedder travels upright or horizontally, an RGN trailer is your best option. The drop-down neck on an RGN trailer allows you to back you tedder aboard using your tractor. Loading and unloading your tedder is the most difficult part of the transport, as the products are lightweight and offer multiple tie-down points.